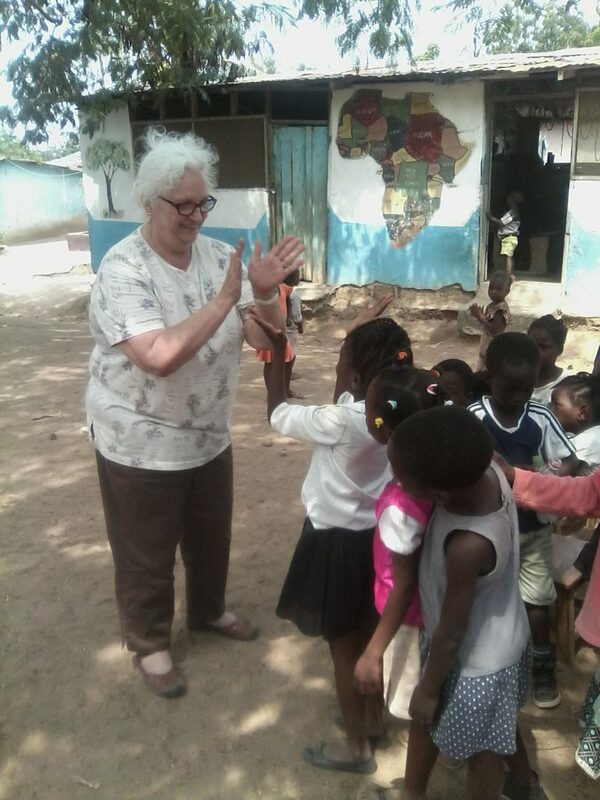 Volunteer in Ghana is a safe, stable West African nation know to have the friendliest people in Africa. Vibrant traditional festivals full of pomp and pageantry can still be seen and heard throughout the country. Traditional open markets provide the sounds and sights of the African bazaar. has a diverse natural heritage which is rich in dense tropical rainforests, unique eco-systems, crocodile ponds, coastal wetlands, botanical gardens and the world largest manmade lake, Lake Volta. 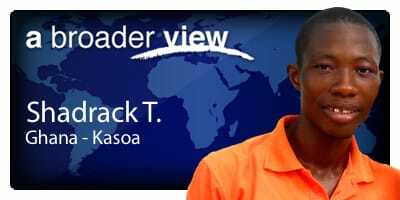 A Broader View Volunteer placement are located in the town of Kasoa in the Central Region and through the Volta Region in small towns and villages. In these areas, 95% of its population lives in rural areas, and subsistence agriculture is the major activity. The poverty experienced in these rural areas is not just a lack of money but also the inability to access basic needs, such as health care and health facilities as well as voluntary HIV counseling and testing. 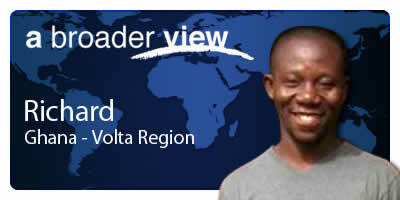 Despite having a lack of such basic needs, the Ghanaian people are world-renowned for their friendliness. Most volunteers are humbled by the everyday happy attitudes of the local people. Our programs allow you to take part in meaningful community service work, while discovering the people, sights, smells and tastes of Ghana. ABV Volunteer support in Ghana is focused on supporting children: orphans, refugees and early education needs. Life changing volunteer support has expanded the orphanage services, provided food, clothing and school uniforms. Medical support in the community clinic, and with the HIV outreach and home visits have helped to save hundreds of lives in these impoverished communities. A Broader View offers programs for college spring break alternatives, university internship requirements and also family volunteering, medical mission work, animal volunteering. 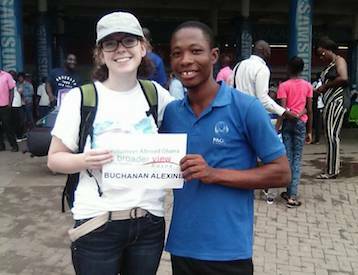 Many volunteers travel to Ghana to discover a fascinating west African culture, while contributing to a community-led program. 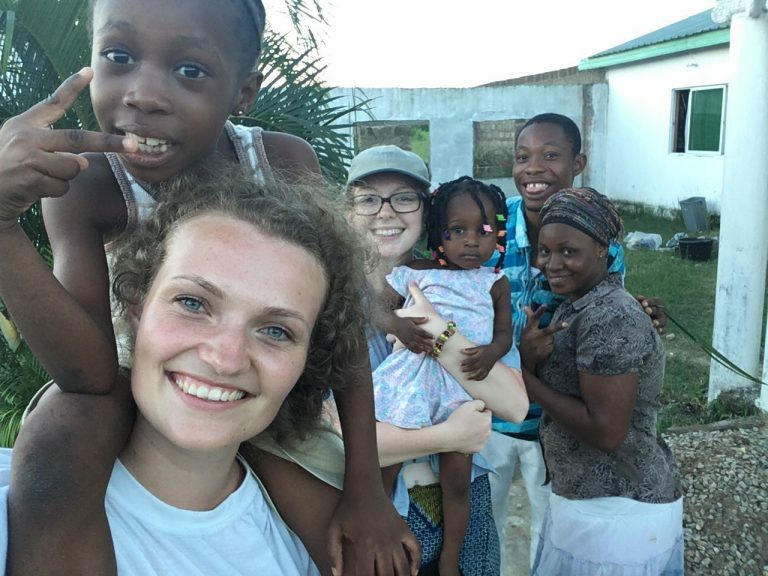 With housing available up to 15 volunteers, A Broader View has hosted hundreds of volunteers in Kasoa including peace corp alternative trips, family volunteering as well as pre-medical, nursing and EMT students seeking a medical mission trip. If you have a group of 5 or more interested in volunteering together, customized programs can be arranged. A Broader View Volunteers has extensive experience working with students, teachers and families providing tailor-made service trips for small groups. Volunteer in Ghana with A Broader View Volunteers a top rated non-profit charity organization, which works tirelessly to support our wonderful volunteers and serve the local communities where our volunteer programs are located. Placements in Ghana are based in the city of Kasoa. Program placements are tailored to the volunteers different interests and skill sets, but still allow volunteers time to explore the African local culture and activities during their free time. The type of programs in Ghana vary widely, offering everything from education to health care. Volunteers can choose between 7 program opportunities in the orphanage. International volunteer help is not only appreciated by the local community, it is severely needed by the millions of Ghanians living below the poverty line. With thousands of children living and working on the streets, as is so often the case in developing countries like Ghana, our volunteer programs are designed to support the needs of local teens and children in desperate need of assistance. Many of our volunteer abroad programs cater to underprivileged women and children’s care, education and health requirements. Our extensive range of social programs near Accra, Ghana programs include: Orphanage Care, teaching, Medical, HIV awareness, Pre Medical/nurse students, women development and many more. Volunteering in Ghana is an incredibly rewarding experience. We welcome volunteers of all ages and from all backgrounds to join us. Whether you’re seeking volunteer abroad programs for college students or voluntary work for over 60s, as a trusted non-profit organization which prioritizes the safety of our volunteers, we are the go-to for volunteers across the globe. We also offer customized programs with flexible arrival dates to best suit the needs of the remarkable volunteers we depend on to help us make the world a better place. If you’d like to volunteer, Ghana is just one of the countries we’ve taken under our wing, supplying a steady flow of volunteers and providing year-round financial support to local projects in near Ghana. Wherever you decide to volunteer, A Broader View give you the opportunity to participate in meaningful community service work, learn a foreign language, make lifelong friends and discover that one person really can make a difference. Your search for the best volunteer abroad programs ends here – volunteer in Ghana with us and gain A Broader View of the world. Welcome to Ghana! 🇬🇭. Our Names are Richard and Shadrack and we are your ABV coordinators while you are staying in Kasoa. Our country has one big city, Accra. But you will be working in Kasoa. We will be ready for support 24/7 in case you need to contact us urgently. We will introduce you to your volunteer location and staff. You are most welcome to seek our assistance and don’t hesitate to ask us questions while in country. Ghana has a tropical climate with daily temperatures ranging between 25º C and 35º C (77 and 95 degrees Fahrenheit). It can be very humid at times, but there is always the sea breeze which ensures that there is a little refreshment. In the north of Ghana it is drier and warmer because of the influence of the Sahara. The rainy season in the North lasts from April to October. In the south from April to June and a second rainy season in September and October. This means that every one or two days, mostly in the evening there is a big downpour of rain for one or two hours. In the dry season, from December to March the harmattan wind blows from the Sahara across the country. The means there is a continuous "sand fog" in the air. Best to avoid Ghana in these months. My overall experience about the program is very good. I was welcomed by the locals with open hands; my host family was super friendly, supportive and was a pleasure to spend time with. I didn’t happen to have any security or health issues or concerns. A Broader View was incredible in preparing us for this journey. I was very nervous, but ABV took us step by step through all the processes we need to ready us for this trip. Also, we felt very comfortable asking questions and they were immediately responsive. Overall my experience in Ghana was one that I enjoyed. My host family was wonderful; the locals are friendly and the landscapes are breathtaking. I cannot wait to come back to Ghana as a traveler to see more of the country.